During the past few weeks the Confederation of Democratic Sims has been in the throes of election campaigns. This election period has been the occasion for the Real Danton to stand up and reveal himself as a "left-libertarian." Ruminating about Second Life politics has also lead me to spin out a paranoid rant about flash-mobbing as a political gambit. But now that I've voted, my attention has already turned back to more serious matters. I’m still looking for a line of business to go into on Second Life. I've been toying with a few ideas, such as for example creating an in-world travel agency. But what does it mean, in fact, to "create a business" on Second Life? In my rather pessimistic post about virtual money, I suggested that it only means playing at business, since the real-life gains seem to be generally paltry. That post was graced with a long comment by renowned Second Life blogger (and CDS's own) Gwyneth Llewelyn, in which she promotes a more positive point of view. Gwyneth points out for one thing that there are many other large land barons, in addition to the notorious Anshe Chung with her Dreamland. For example, the Azure Islands, owned and operated by the Australian company DeepThink, directed by Second Life residents Adam Zaius and Nexus Nash, now have a larger landmass than Dreamland. Even smaller barons such as Prokofy Neva and Desmond Shang of Caledon have at least a thousand paying customers each. 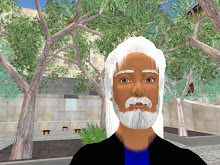 Gwyneth also gives numerous examples of promising sectors of economic activity on Second Life, including fashion, education, art, music, lawyers and environmental groups. She even mentions finance, regretting that Linden Labs has made it difficult for the finance subculture to survive in Second Life. In the fashion sector, Gwyneth mentions Ana Lutetia, whose website review of the Second Life fashion scene has become a reference. Gwyneth also refers to the giant education sector on Second Life, noting that "they organise huge venues, sponsor thousands of projects, do RL conferences all the time, and write hundreds of papers." She specifically points to the New Media Corporation as an example of an in-world business that provides services to this education sector. My initial reaction to Gwyneth's comment was to reiterate my earlier objections about the generally low real-dollar profitability of Second Life economic activity. What do the earnings of the land barons represent in terms of real dollars? Moreover, the big land barons, sitting at the top of the Second Life economic pyramid, hardly represent the average Second Life business owner. In the other sectors, what are the real economic gains of individual entrepreneurs, when translated into US Dollars? The SL fashion sector, including clothing, hair, skins and so on, is undoubtedly enormous, even in real life dollars. But since each separate transaction is for only a tiny amount, one wonders about the net earnings of the individual small creators and entrepreneurs. And for all the size of the Second Life education sector, how many large in-world service providers can it actually support? My objections undoubtedly contain an element of truth. But I've recently come across additional information which corroborates Gwyneth's point of view. Studying the SL History Wiki in more depth, I've been realising how big Second Life and its economy actually are. And I've been reading a fantastic paper by Cory Ondrejka, which has helped me better understand the Second Life "market." Prokofy Neva in a recent post credits the telehubs and Anshe Chung with stimulating in-world creativity, but Cory shows that the key insight in fact came earlier, from Stanford Law professor Laurence Lessig. Cory describes Lessig's contribution as follows: "Specifically, he made the comment that it was a mistake to ask users to create a world but not allow them to own what they had made." The in-world economy and the explosion of resident creativity both spring from this initial decision to allow individual ownership of created objects. Cory goes on to suggest that the in-world economy breaks down the dichotomy between play and profession. In other words, playing at business in Second Life is true economic activity, based on exchange between real individuals linked into networks. The intensive networking that goes on in Second Life is one of the aspects that drew me here in the first place. In this context, where the boundary between work and play washes away, the definition of "economic activity" also expands beyond mere in-world exchange. For me personally it has little to do with Linden Dollars, and everything to do with audience and notoriety. Let us say, for example, that I create an in-world travel agency as my Second Life business. This would mean concretely that I would create in-world links to a plain old website, full of pages about possible in-world travel destinations. (Such websites already exist of course, and I may discuss them in a future post). I could then contact landowners to see if they would give me commissions on travellers or buyers that I send their way. But the net profits would probably be rather meagre when exchanged into US Dollars. I might however want to create such a "company" in order to procure something other than Linden Dollar commissions. If the website succeeded, my payoff would be notoriety: I would have captured an audience. And I have in mind a number of ways to profit from that buzz.